I must apologise to my regular readers who like to see regular updates on this site, along with seeing some of the bird photos I’ve taken. Life has been a little rugged lately with illness, busyness and having to give a great deal of assistance to my dear wife. She recently broke a bone in her foot as the result of a fall, though it seems to be improving steadily. One of the results of the broken bone was our doctor insisting on a bone density test, so this necessitated a trip to Adelaide, an hour’s drive from home. 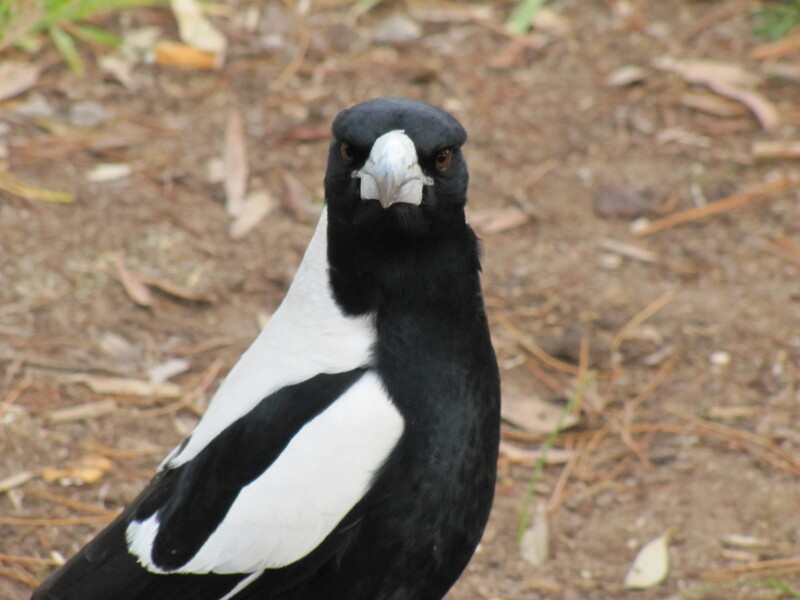 On the way along the South-Eastern freeway near Mt Barker, I was amazed to see a very large gathering of Australian Magpies. It is quite common to see up to about a dozen feeding in a loose flock, but this gathering must have numbered between 50 and 60 – I couldn’t count them accurately while driving at highway speed, nor did I have my camera ready. They were all feeding in the recently mowed grass on the roadside verge, an area of several tennis courts. Such a large congregation of magpies is, in my experience, quite unusual. I can only surmise that the mower, which was working about a hundred metres further along, had stirred up a feast of insects.